When a project is used to share an environment, the usage is charged against the environment owner, not the person using the environment. Your company account can have up to 1,500 projects. Any Skytap standard user, user manager, and administrator can create a project. Type a Project name (all others fields are optional). 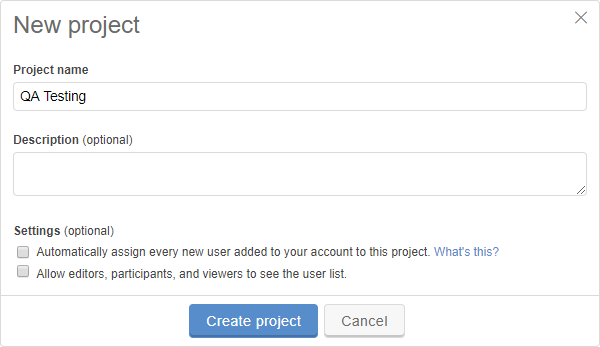 Click Automatically assign every new user added to your account to this project. Select the project role that new user accounts are automatically granted. For a description of the project roles, see Understanding project roles. This applies only to new Skytap user accounts that are created after this setting is enabled. It does not automatically add existing users to the project. This is usually only configured one time for an account. In most cases, you don’t need to configure this. For more information, see Automatically adding new users to a project. To give any project user access to view the other users in the project, click Allow editors, participants, and viewers to see the user list; otherwise, this information is only available to users with the Manager project role. You can change the name of a project, its description, the automatic role, and the visibility of the project user names to other users in the project. To change the owner of a project, see Changing the owner of an environment, template, project, or asset. Description – Add or change the description for the project. Owner – The owner of a project or an administrator can change the owner of the project. If you do not see this option, you don’t have permission to change the owner. Automatic role – Choose whether new Skytap users should be granted access to this project as part of their account setup. Select No, do not use automatic role if you do not want new users to have access to this project. Select Yes, use automatic role, and then choose a project role if you want new users to have access to this project. If you have a large number of projects (your account can have up to 1,500 projects), you may want to delete unused projects. You must be the project owner to delete a project.